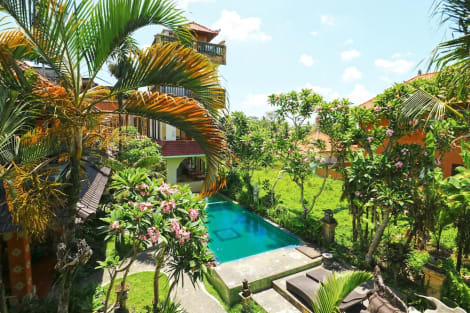 With a stay at Kakiang Bungalows in Ubud (Pengosekan), you'll be within a 10-minute drive of Ubud Monkey Forest and Ubud Traditional Art Market. This spa resort is 11.9 mi (19.1 km) from Sanur Beach and 1.2 mi (2 km) from Ubud Royal Palace. With a stay at Champlung Sari Hotel Ubud in Ubud (Ubud City-Centre), you'll be within a 5-minute drive of Ubud Traditional Art Market and Ubud Royal Palace. This hotel is 0.9 mi (1.5 km) from Puri Lukisan Museum and 1.3 mi (2.1 km) from Campuhan Ridge Walk. Make yourself at home in one of the 6 air-conditioned rooms featuring kitchens. LCD televisions with cable programming provide entertainment, while complimentary wireless Internet access keeps you connected. Conveniences include safes and complimentary bottled water, and housekeeping is provided daily. Make yourself at home in one of the 37 air-conditioned rooms featuring fireplaces and LCD televisions. Rooms have private balconies or patios. Complimentary wireless Internet access keeps you connected, and cable programming is available for your entertainment. Conveniences include safes and desks, and housekeeping is provided daily. Bathrooms have bathtubs or showers and complimentary toiletries. Conveniences include desks, and housekeeping is provided daily. Make yourself at home in one of the 15 air-conditioned rooms featuring minibars and LCD televisions. Rooms have private balconies or patios. Complimentary wireless Internet access keeps you connected, and cable programming is available for your entertainment. Private bathrooms with showers feature complimentary toiletries and hair dryers.